In some ways, Assassin’s Creed is prime MMO material that wouldn’t be tarnished in translation: it’s already about bunny-hopping through a world filled with visible artifacts, that flicks on and offline without warning. Vincent Pontbriand made the same point last week without any mean jokes at the MMO genre’s expense. The Assassin’s Creed Unity producer said he’d “love” to build a massively-multiplayer entry in the stealth-parkour series. 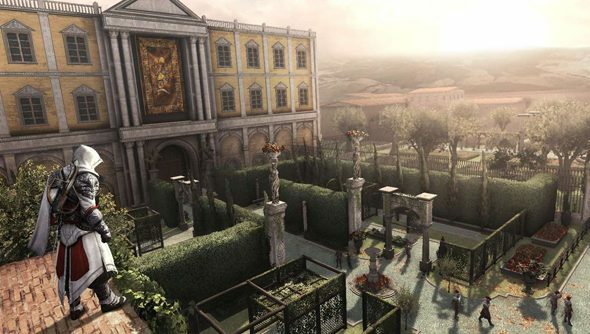 Pontbriand said an MMO would be the perfect excuse to revisit the several cities and storylines Ubisoft have introduced to the Assassin’s Creed universe in the last decade. Pontbriand pointed out that Assassin’s Creed Unity’s four-player co-op was the “first step” toward an online version of the game. “We haven’t gone as far as we want, you cannot share the world with other groups of people,” he said. “When you’re online with three other friends you’re just the four of you in your session of Paris. In the same (admittedly large) building that houses the Assassin’s Creed Unity team, Ubisoft Montreal developers are building their first-ever MMO in The Division. Is the Assassin’s Creed series the first place you’d transfer some of that talent to? Or can you think of a better candidate in Ubisoft’s stable?